Thursday’s post “What would an extra $50k a year mean for Jay and Wally’s childhoods?” sparked a terrific discussion in the comments section. Readers wrote about the choices and tradeoffs their families are considering around where to live, how much money they feel they need to make, and what kinds of childhoods they want for their kids. For me, receiving so many substantive replies was equivalent to the magic moment in that viral video Caine’s arcade, where the little boy comes back from lunch to find people lined up to play his homemade games. So thank you Carter, Oonagh, Jill, Jessica, Marc, Amanda, Heather, Sarah, and Karen! I agree that the cost of housing can’t be written off entirely as a “material” acquisition on par with the type of car you drive and the quality of the pans you cook with. Which left me curious to find out just how much of the price of a house is determined by the quality of the public schools that serve it. It turns out to be a hard question to answer. I read two studies, one based on the real estate market in metro St. Louis and the other based on home prices in Mecklenburg County, North Carolina. Both papers point out that effects of school quality are hard to disentangle from the effects of neighborhood quality: Houses served by good public schools tend to be located in more upscale neighborhoods, making it hard to differentiate the premium you’re paying just for the schools and the premium you’re paying for the right to live within walking distance of a chai latte. Writing now in more personal terms, I think that where to live when kids hit school-age is one of the hardest and most interesting decisions in the life of a family. It’s hard because most of us won’t get everything we want- we’ll either stretch our housing budgets, or incur longer than desirable commutes, or trade down in school quality. And I think it’s a uniquely interesting decision because it forces parents to think about what they value in ways that few other decisions do. Really everything’s on the table: education, money, daily lifestyle, long term aspirations, the value of diversity. Caroline and I talk about these issues a lot and we haven’t come to any firm conclusions. Partly that’s because we’re at the mercy of the academic job market and don’t know which part of the country we’re going to end up settling down in. I do know that part of me is relieved that Caroline’s career compelled us out of Philadelphia, because I loved the city and would have wanted to stay there, but I have no idea how we would have navigated the schools issue had we still been there when Jay was ready for kindergarten. Finally, I’d just say thank you again to the commenters for propelling this discussion forward. I find these to be an endlessly interesting and important set of issues. I will certainly write a lot more about them in the future, and I hope many of you will continue to join me in the process. What would an extra $50k a year mean for Jay and Wally’s childhoods? This morning at breakfast we watched out the window as our neighbor’s nine-year-old daughter Ava walked to school. She was bundled in a coat and scarf, which maybe was a touch warm for the weather, and carried her trumpet at her side. We see Ava walk by most mornings and Jay often plays with her in the afternoons when she comes outside to kick a soccer ball. And this morning I was struck by how nice her childhood seems. She has a ten-minute walk to school. She plays an instrument, she plays soccer, she’s a Girl Scout (who sold us those Thin Mints I’m always writing about), and her parents are around a lot. I don’t know her family very well, but in broad strokes she’s got the kind of childhood I’d want for Jay and Wally. Which got me thinking about how money influences the kind of childhood a kid experiences. There’s still some uncertainty about what our adult standard of living will look like, but between Caroline’s academic salary and my less predictable freelance income, we should be able to earn at least, say, $100,000 a year. And my sense is that that would be enough to give Jay and Wally a lifestyle that roughly resembles Ava’s. We could afford to live in our neighborhood, where homes sell for under $275,000, and we’d send our kids to the Ann Arbor public schools, which are perfectly good. But what if we found a way to earn more than $100,000? It’s unlikely that we’ll ever be rich by the standard President Obama was pilloried for using—families that make more than $250,000 a year—but if we made it a priority we could probably earn an additional $50,000 a year. What would that mean in terms of how Jay and Wally grew up? To answer that question Caroline directed me to a report put out annually by the U.S. Department of Agriculture called Expenditures on Children By Families. The report analyzes the amount of money that families at different income levels spend on their children. The most striking thing about the chart, to me, is the relative similarity between what low income and middle income families spend compared with what high income families spend. Put another way, high income families spend a lot more on their kids than other families do. 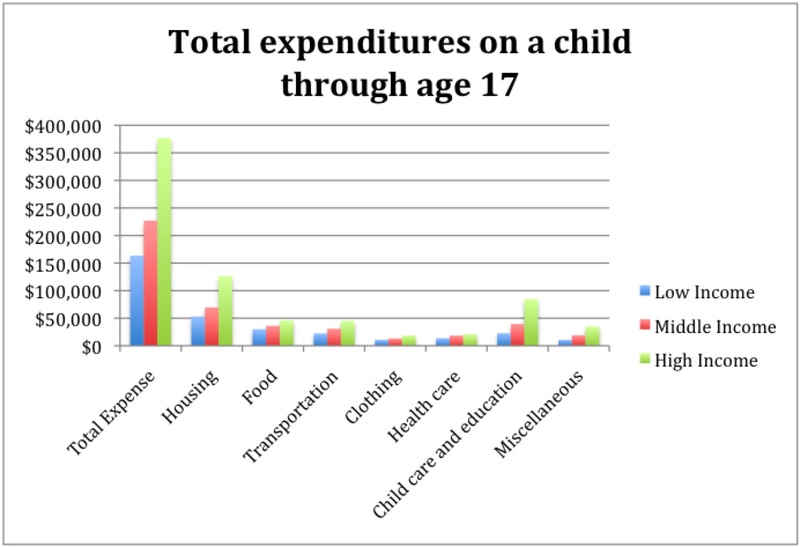 The following chart, recreated from page 18 of the report, breaks down expenditures on a child into seven categories. 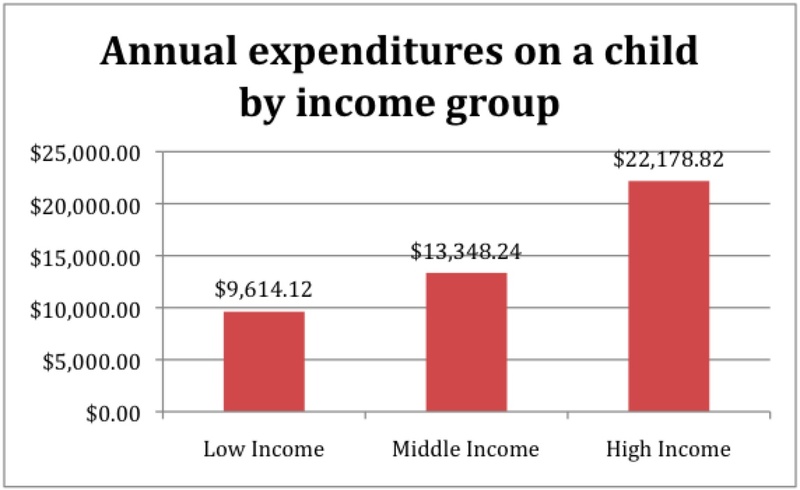 The chart is based on expenditure percentages in a middle income home, which are similar but not identical to the way expenditures break down in lower and high income homes. One thing that leaps out at me from the chart is housing (which includes mortgage payments, property taxes, rent, maintenance, utilities, and home furnishings like furniture and appliances). 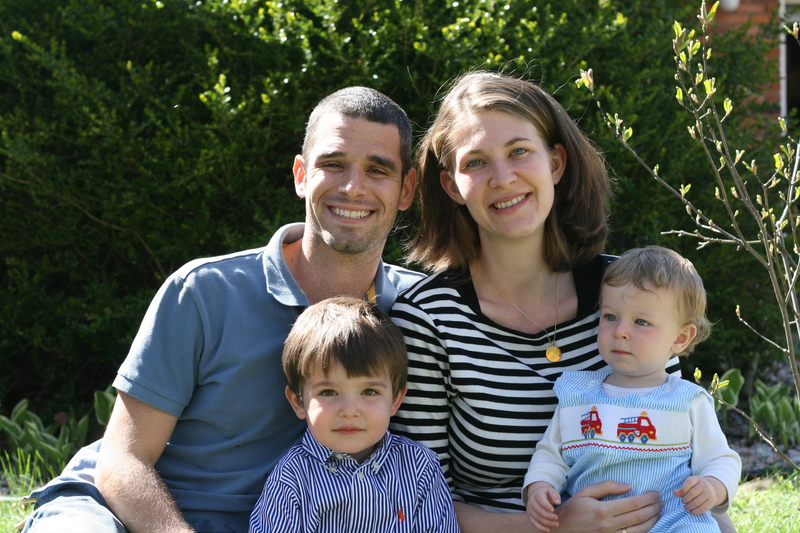 Housing is the biggest contributor to the expense of raising a child. It also seems to me to be one of the easiest places to save money without impacting the quality of life a child enjoys. In Ann Arbor, for example, we could buy a house in our current neighborhood for $275,000 a year or we could buy one a mile away in Burns Park for $450,000. Both neighborhoods are quiet, leafy, and filled largely with two-parent families. Burns Park has nicer housing stock and is closer to campus. Living there would put a big pinch on our household budget but it’s hard for me to see how it would really improve Jay and Wally’s childhoods. This next chart is the one you’ve been waiting for. It shows where the additional spending on a child goes as families move up the income scale. High income families spend a lot more on their children over the course of their childhoods—almost double ($377,000) what middle income families spend ($226,920). When I consider what that extra money gets you, I think in two categories: stuff and non-stuff. 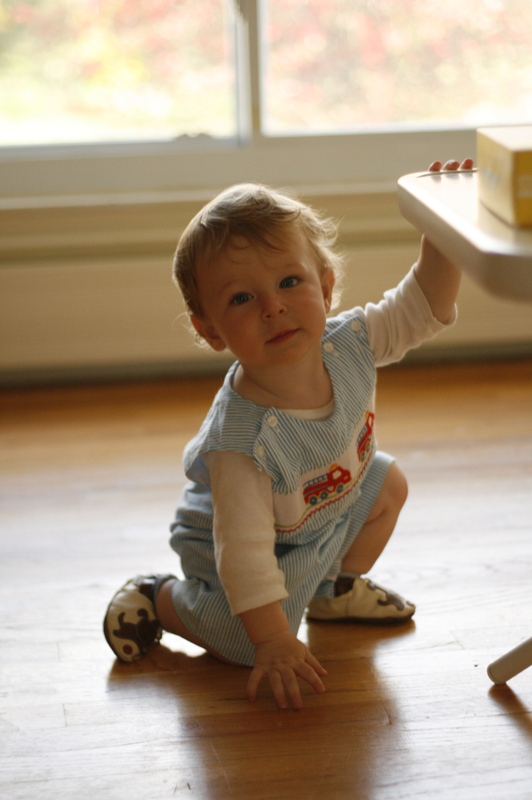 Stuff includes housing, food, transportation, and clothing, which comprise 67 percent of the cost of raising a child. Earning $150,000 a year versus earning $100,000 a year gets you more stuff, and better quality stuff, but I don’t think it does much to improve the quality of a kid’s childhood. What does it matter if your parents drive a Honda or a BMW, or whether your backpack costs $40 or $100? Once a certain minimum standard has been reached, each additional dollar spent on more or better stuff doesn’t add a lot. And that minimum standard can be reached easily with a family income of $100,000 a year. What about non-stuff? 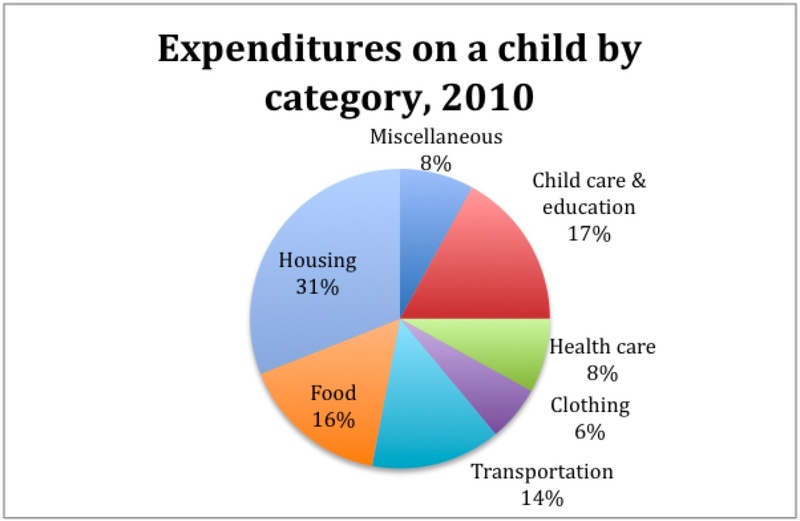 That includes health care and child care/education, which together comprise 25 percent of the cost of raising a child. One interesting aspect of the data is that middle and high income families spend similar amounts on their children’s health care ($18,420 and $21,150 respectively from age 0-17). To me this suggests two things: a) As families move from low to middle income one of the first places they divert their increased income is to health care; and b) There’s only so much you can spend on health care, at least for children who tend to be pretty healthy. The other non-stuff category is child care/education. Here’s where you see the single biggest gap between low, middle, and high income families in terms of total dollars spent. Over the course of a childhood, low income families spend $22,710, middle income families spend $39,420, and high income families spend $84,870. That’s a pretty staggering difference and it’s pretty obvious what accounts for it: daycare v. nannies when kids are young, and public v. private school when kids are older. So, when Caroline and I think about how earning an additional $50,000 a year would impact Jay and Wally what we’re really thinking about is the value of private school. I don’t have any data that tries to quantify the value of private school but I’ll do some digging. Of course, the added value of private v. public school varies a lot depending on the quality of the public schools where you live. In Philadelphia, where we lived until last August, the gap between the private and public schools was huge; in Ann Arbor I imagine it’s a lot smaller. Before I wrap up, a few notes. First, this discussion only includes expenditures on children through age 17, so it doesn’t include support for college, post-graduate education, and the transition to adulthood, which are obviously huge and consequential expenses. Second, the expenditure categories don’t capture things like vacations and summer camp, which are both places where I’d expect to see big gaps between middle and high income families. Third, I framed this post in deliberately simplistic terms in order to highlight top-level differences by income groups. I’d encourage people to read the USDA report and to raise questions in the comments section. Overall, I’m interested in writing more about the tradeoffs that parents should consider as they think about how to organize family life. What would we gain by earning an additional $50,000 a year? What, if anything, would we have to give up to earn that money? And how do the organization of time and the availability of money affect a family culture and children’s outcomes? I look forward to thinking about these questions in future posts. Today would have been my mom’s 56th birthday. Every year on this day for the last six years I’ve tried to figure out how best to remember her. The first year after she died I placed a picture of her in the breast pocket of my shirt before I went off to work. Another year my brother, sister, stepfather, and I each went out and bought yellow flowers. Three years ago I made zucchini bread, my favorite of all the things she liked to bake. None of these gestures ever felt right to me. I think the problem was less in the pictures, the flowers, or the bread than in the nature of the day itself. Anything I could do in honor of her birthday felt insignificant compared with how much I missed her. That insignificance had the effect of accentuating her absence and I worried that I was failing to commemorate her in the right way. As a result, I always felt a small sense of relief when my mom’s birthday had passed. But today, for the first time since her death, I woke up eager to celebrate her birthday. In fact, for more than a week I’ve been talking with Jay about how Grandma Jane’s Birthday is coming up soon. A little before 8am I propped Jay on his changing pad and tried to tell him a few things about his grandma. It was hard to know what to say so instead I demonstrated how hard Grandma Jane would have hugged him and I told him that she would have given him so many kisses he would have never been able to wipe all of them off. (Jay relishes wiping off the kisses that Caroline and I give him.) Then I tried to explain just how much Grandma Jane would have loved him if she were still alive. After dinner we sang happy birthday and Jay got a cup of ice cream. While he was eating it Caroline brought over a photo that we keep on the fridge, taken just before my sister’s rehearsal dinner in 2006. Caroline asked Jay to point out Grandma Jane, which he did. Then a few minutes later, as he was scraping up the last of his ice cream with his spoon, he picked up the picture again. Jay doesn’t understand, I don’t think, what death means, but he does know it’s something serious and outside the realm of his experience. I’ve thought hard about how to describe the look on his face whenever he brings up the fact that my mom isn’t alive anymore. It’s seems to me like a combination of bravery and an intent desire to understand. After ice cream we opened presents. A few years ago my sister initiated the tradition of exchanging gifts on our mom’s birthday by sending Jay an illustrated version of Wynken, Blynken, and Nod, a lullaby our mom sang to us when we were young. This year we sent her one-year-old son Peter his first Grandma Jane’s Birthday present: A paper punch that makes cutouts in the shape of a butterfly. Caroline, Jay, Wally, and I sat on the floor in the living room. We opened Wally’s present first. It was a book about animals that has textured pages, so you can feel the deer’s rubbery nose and the baby bunny’s soft fur. Then we opened the box containing Jay’s gift. It was a kid-sized chef’s toque. I thought it was cute and appropriate given how much my mom liked to bake, but Jay, after a week of eyeballing the sealed box, was underwhelmed. He discarded the toque and grabbed at Wally’s book. Several times during the rest of the evening I heard him say to himself, “Why did I get a chef’s hat?” When I called my sister tonight to tell her about his reaction we laughed so hard we cried. I know there’s only so much I can do to make my mom a part of Jay and Wally’s lives. If it’s hard as a kid to comprehend how much your parents love you, it’s close to impossible to appreciate how much someone you never met would have. To a large extent Grandma Jane will always be an abstraction to Jay and Wally, someone they see in photographs and hear their dad talk about but not more than that. Jay and Wally may never know how much their grandma would have loved them but that doesn’t mean she has to be completely absent from their lives. Joining her memory to the giving of presents and the eating of ice cream seems like a good start. I hope her birthday will become a family holiday and that the force of tradition will help Jay and Wally keep in their lives a person who by every measure but physical proximity is an essential part of who they are. 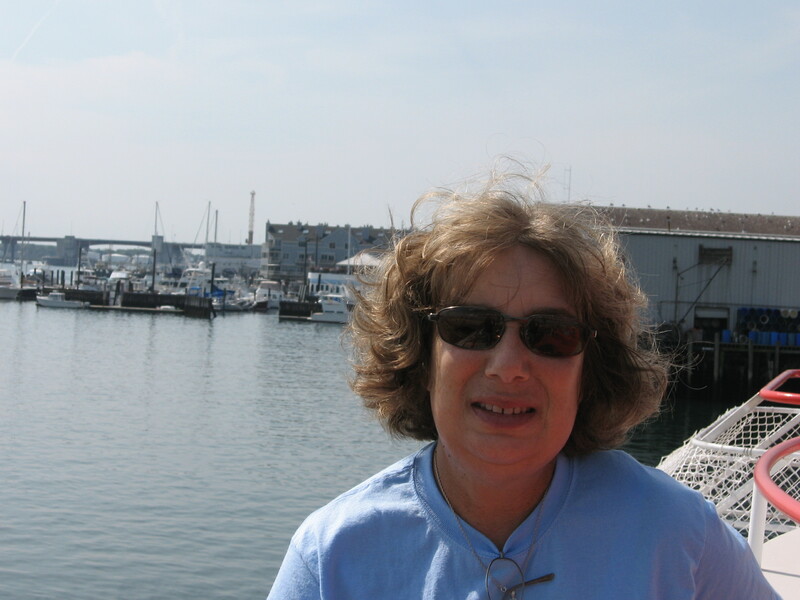 For me, celebrating my mom’s birthday with Jay and Wally has meant something else: A chance to think about her in joyful terms that let me feel closer to her than I can when I try to approach her memory directly. It’s close to bedtime in Ann Arbor but I don’t want to turn out the lights just yet. It feels good to be able to say that I’m not quite ready to see my mom’s birthday go. The house we live in has been a rental for the last three years and it shows in the gardens that ring the backyard. They are cluttered with weeds, sprouting trees, tall grass, and several seasons worth of the dead stalks from fallen perennials. Yet amidst the neglect there remain signs of cultivation: Already this spring dozens of daffodils have sprouted; the hastas are taller every time I look at them; and there’s promise of a savannah of irises within a month’s time. This afternoon Jay and I spent several hours cleaning up the gardens. We uprooted saplings, tugged on weeds, picked up debris and pulled out little bits of trash: an old canning jar, a rusted metal rendition of the American flag, a fallen wind chime. Jay helped in spurts. He was particularly engaged when I brought out the pruning shears; he cheered me on as I hacked away at an overgrown lilac bush. Even when Jay wasn’t directly contributing to the effort he was a pleasure to have around. He paid close attention to what I was doing and asked good questions. I explained to him why trees have roots, why weeds are undesirable and, when I nicked my ring finger on a rock, I had the chance to demonstrate something I’ve been trying to impress upon him for a year: Not all cuts are worth crying over. As we worked alongside each other it occurred to me that this is the kind of time I don’t often get with Jay- and maybe most American parents don’t often get with their kids. The time I do have with Jay tends to fall into one of two categories: Either I’m dragging him along when I go to the supermarket or we’re playing cars and Legos on the floor at home. The former activities are located firmly in my world; the latter are located firmly in his. We have few experiences that you might say we’re equally enthusiastic to be a part of. Of course, he’s not quite three-years-old, so the things we can do together are limited. 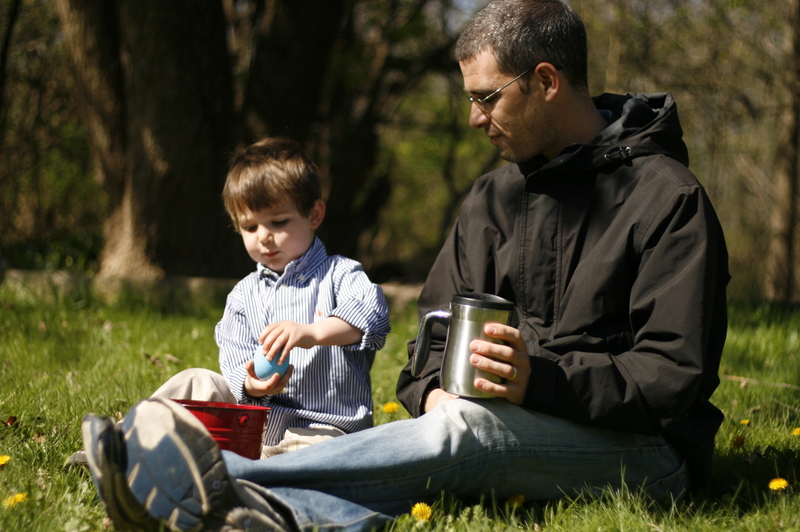 But when I think about the ways that parents and kids spend time together it seems that the shared space- where an activity is neither solidly an adult activity nor solidly a child’s activity- is narrow. Shooting from the hip here, I think the reason for this narrowness is that there’s less overlap between adult work and children’s work than there was, say, 150 years ago. Back then, when life revolved around the family farm, there was a certain equality to everyone’s activity. But over the course of the 20th-century the activity of both adults and children grew increasingly specialized. Adult work took place away from home and took on a character that didn’t lend itself to working alongside one’s child. At the same time, children’s activity elaborated into school, specialized activities, and a whole realm of engagement that isn’t all that much fun for adults to share in (I’m thinking of the post I wrote a couple months ago about the glazed looks on parents’ faces at the Ann Arbor Hands-On Museum). But, as Goldilocks might have said, working alongside Jay as we cleared a garden felt just right. I found the work stimulating and productive; he found it interesting and fun. There are not a lot of things we do together you could say that about. So, to keep a good thing going we’ve already made plans to go next weekend to a nursery in town where we plan to pick up bags of soil and cold weather vegetable seeds. I’ve never gardened and previously wouldn’t have said it had much appeal to me. But now that I’ve gotten my hands a little dirty, it seems to me to be about the perfect way to spend an afternoon at home taking care of a kid. This past weekend I went to New York City for one last go around with a good friend before he becomes a father later this spring. Our itinerary included a baseball game, a barbeque, beer, and a lot of ping pong. When we finally turned out the lights a little after 3am on Friday night, I thought of Jay and Wally back home, and how it wouldn’t be long until they began to stir. Earlier on Friday evening I’d talked with Jay and Caroline on the phone as I walked from the subway in Brooklyn. Jay was hysterical. Caroline explained that they’d been reading Where The Wild Things Are and that Jay had started crying when they came to the part where Max gets in his boat and says goodbye to the Wild Things. Apparently that part of the story was more than Jay could handle at a time when themes of (temporary) abandonment were alive in his own life. We talked on the phone for a few minutes. Jay sniffled throughout but managed to pull it together long enough to tell me what he’d had for dinner (pasta with grapes and salad) and to confirm what I already knew via text message, that he’d been a good boy during quiet time that afternoon and had earned the prize of a single Thin Mint cookie from the freezer. But then he asked me if I was coming home tomorrow and I told him the truth that it would be a couple days yet. He started sobbing again. I was at a loss, simultaneously heart broken and disoriented: It was just not the kind of display I’m used to seeing from Jay. I arrived at my friend’s house ten minutes later. We sat down and started to catch up but for an hour or so my mood was still under the influence of that conversation with Jay. When I thought about it later, I realized there were a couple different emotions operating. The most prominent one was guilt. Jay was back home suffering in the depths of anguish so that I could…Eat pizza and drink beer? When I tallied things up like that it seemed hard to justify absconding for the weekend. Of course, parents shouldn’t tally things up like that. Otherwise our kids would hold us hostage. In a masterstroke of self-justification it occurred to me later as I walked to a bar in Brooklyn Heights that one of my foremost responsibilities as a parent is to help Jay and Wally calibrate their emotions to the reality of the world rather than always trying to fix the world according to their emotions. A second emotion, nearly as strong as the first, was vanity. When I arrived at my friend’s house I wanted to tell him about my phone call with Jay—I wanted to emphasize just how hard Jay was sobbing, I wanted to play up the poignancy of him starting to cry because of a book. My heart broke for Jay but it also swelled a little bit, too: It feels good to be missed like that, to be so thoroughly at the center of someone else’s world. The weekend proceeded and Jay got his emotions under control, suggesting that half the outpouring of the night before had been because he was tired. We Skyped on Saturday morning before he went off for a belated Easter egg hunt at a friend’s house and we talked again that evening before he went to bed. On Sunday evening he and Caroline and Wally picked me up at the Detroit Airport. Both boys had fallen asleep on the ride over, but Jay roused as the car came to a stop. I peered in at him through the window beside his carseat. His eyes were open but sleep was still heavy on his face. He didn’t react to seeing me. I got into the passenger seat and Caroline merged onto the highway. Every couple minutes I looked back at Jay. He was reviving, slowly. When I thought he was ready I blew him a kiss. He blew me a kiss back. I stammered a groggy reply—“Yes, the door’s locked, go back to sleep”—which was all the reassurance Jay needed. Before I fell back asleep myself there were two things about his comment that caught my attention. The first is Jay’s seemingly self-created phobia of dogs. He’s never had an obviously bad experience with a dog and he’s spent plenty of time with my sister’s dog and my stepfather’s dog, both of whom are world-class friendly. But he remains wary/petrified of dogs nonetheless. Whenever we hear a dog bark Jay asks, always, without exception, “Is that dog behind a fence?” As far as I can tell, it’s a fear he brought with him from the womb. The second thing that caught my attention was his use of the uni-name: DaddyMama. Jay’s been calling us this for a long time—nearly since he learned to talk. When he was eighteen-months-old he’d sit in his carseat and sing out, real fast, “DaddyMama, DaddyMama, Daddy-A-Mama!” with this degree of spirited enthusiasm for our names that nearly broke my heart and made it impossible for me not to shift my gaze, just a for a moment, from the highway in front of me to his face in the backseat. Caroline and I talk sometimes about the extent to which Jay sees each of us an individual. The other day Caroline and Jay were out in the driveway and Jay asked Caroline to kick the soccer ball over the house so he could chase it. This is something that Jay and I do together often and Caroline laughed to herself at his request. She thought it was funny that he didn’t perceive that punting the soccer ball just isn’t the kind of thing she does. There are other activities that break down along Daddy-Mama lines: I’m more likely to help Jay use a screwdriver to take apart his toys; Caroline is more likely to sit down and color with him or read him a book. But in terms of moods I don’t think he has any consistent preferences—he’s as likely to want me as he is to want Caroline when he’s sick, or tired, or wakes up in the middle of the night. So Jay doesn’t have the exact same relationship with me that he has with Caroline, but all told I think there is broad equivalence in his attitudes and perceptions of the two of us. Which brings me to a thought I remember having soon after Jay was born: It’s hard for a child to perceive his parents accurately under any circumstances and harder, still, when they’re married. My parents divorced when I was 10. One effect of the divorce was that I gained a clearer view of my parents as individuals: I’d see my mom cooking by herself or hear my dad putting away dishes in the house at night and I was struck by the fact of each of them as individuals, distinct from each other and distinct from me. I didn’t gain perfect knowledge of them and even today my dad is a little obscure to me, but the divorce did throw each of them into relief. 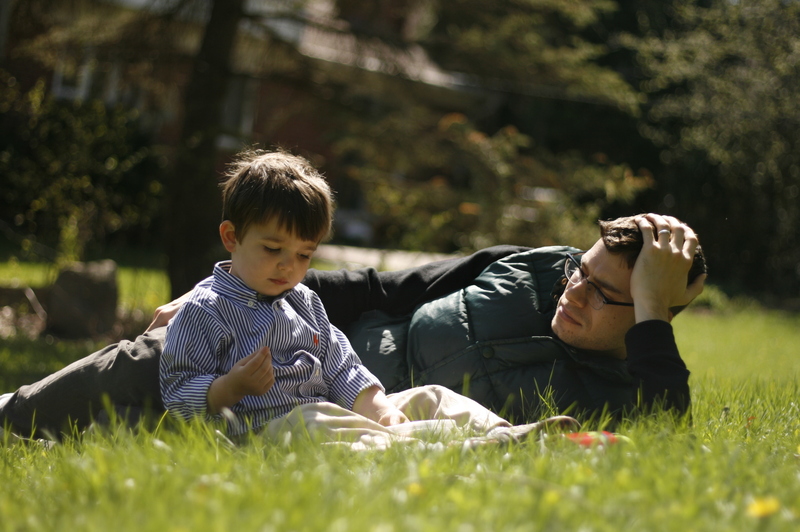 Marriage makes it harder for a child to perceive his parents for two reasons. Within marriage each parent adapts his or her behavior to the norms of the union: My parents almost certainly acted differently (and probably more like their true selves) outside of marriage than inside of marriage. And second, when your parents are married you’re more inclined to default into the mode of thinking of them as a pair rather than thinking of them as individuals. So how do I feel about being part of DaddyMama? I like that Jay and Wally have to get through DaddyMama first before they can get to me—like it gives me a little cover for my flaws. And I imagine that as they grow up they’ll take comfort in the thought that DaddyMama is on guard, making sure the dogs can’t get in—even if the source of that comfort is to some extent a product of their own invention. My brother Ryan and his wife Allison were visiting us over the weekend from New York City (you might recall them from a ‘goodbye Philadelphia‘ post last summer). They rarely make an appearance without some little trick up their sleeves. 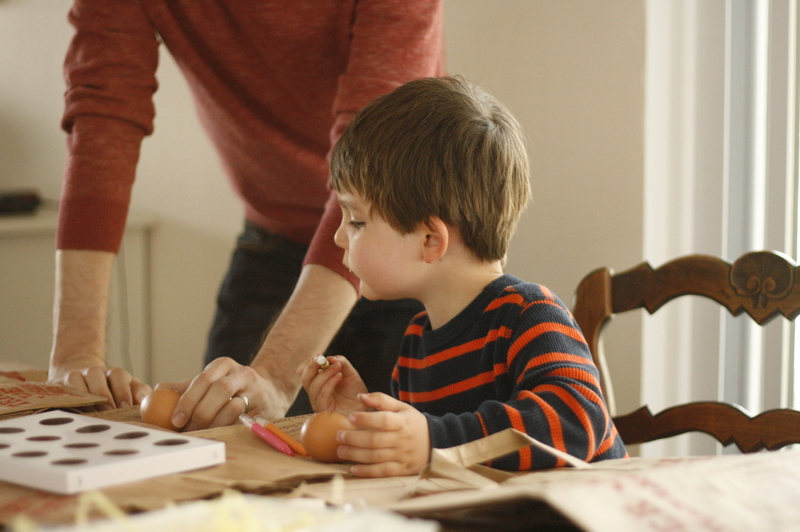 This time it was egg decorating. Caroline and I usually don’t have the wherewithal to organize this kind of thing but on Saturday afternoon, when I would have been ready to mark time until bedtime, Allison mixed cups of dye, laid out rows of stickers, and stewarded Jay through the decorating process. Is he in the garage? No, he’s in the backyard. Is he a friend? Yeah, he’s very nice. Is he going to eat the eggs? He already had breakfast. 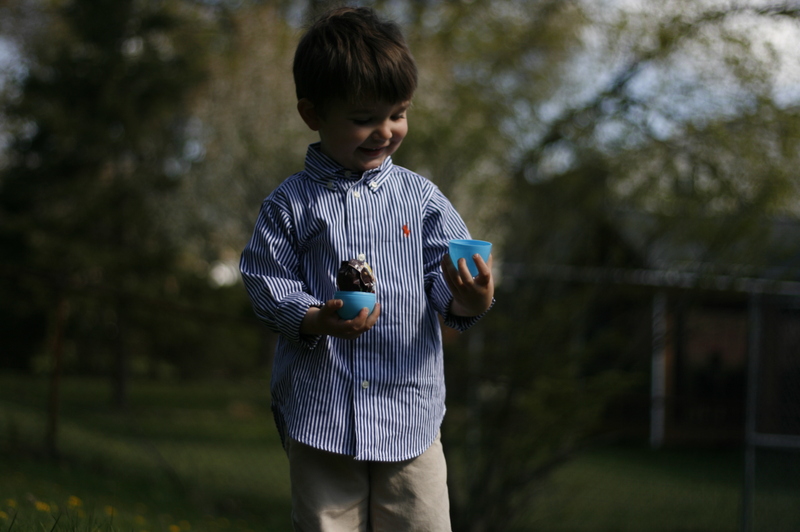 In the process of explaining the Easter Bunny to Jay it occurred to me that he has reached a developmental stage I hadn’t anticipated: He’s old enough to understand the literal story of the Easter Bunny but not old enough yet to understand the magic in it. Put another way, he can’t distinguish between an airplane flying overhead, a dog running up the street, and a bunny hiding candy-filled eggs in his backyard. All three fall into the category of: If you say so. We had a breakfast of cinnamon rolls from a can and Skyped with my cousin in New York and Caroline’s mom and sister in DC. Allison and Ryan began to worry that the robust Ann Arbor squirrels might get to the eggs first if we didn’t hasten outside so we cut the Skyping short, equipped Jay with a red metal bucket, and headed to the backyard. 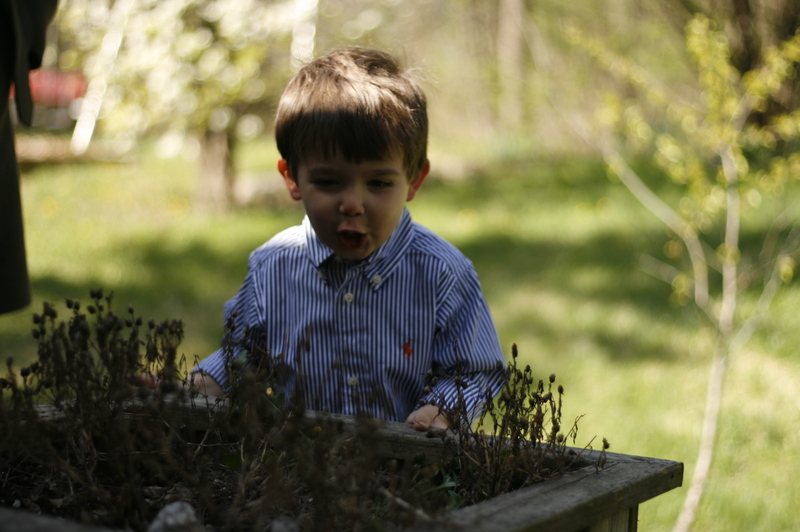 Jay hunted eggs with uncontained glee. There were a few obvious ones in the middle of the yard which he snatched up first. The ones on the periphery, tucked into flower boxes and behind stands of wilting daffodils, required more coaching. The fact that he hadn’t fully earned the discovery did nothing to diminish his enthusiasm upon spying an egg. After all the eggs had been collected the five of us rested on the small slope in our backyard. It was breezy but sunny. We sat on the long grass amid the dandelions and munched on Skittles, jelly beans, and M&Ms. There was a certain equality to the mood. As Jay sat beside me on the grass and leaned against my brother’s legs, it felt for a short while like we were all sharing the same experience: The thrill of a backyard transformed, the pleasure of candy, the warm sun on our skin.